The expression “tough as nails” is one my parents often used to describe someone who could prevail despite long odds. It’s appropriate to describe the wild horses of the Pryor Mountains and their ability to tough out the brutal winter of 2017-2018. In April our Facebook guru, Linda Hanick and my dog, Quinn, accompany me to the range where it snows all five days we are there. . . not hard mind you, but hard enough to remind us that spring has not yet sprung! Despite the wind and cold, the mountain blue birds are back and down low the tom turkeys are displaying for the hens. On our trips up Tillet Ridge, below the mines hill, we’re rewarded with close up views of Mescalero’s band and a very pretty “hanger on." Pride is back with his mother and little sister. . . for now. Pride was on his own in late December and early March when we visited his mountain home, but not now. Why Mescalero snakes him home during a snow squall is beyond me. 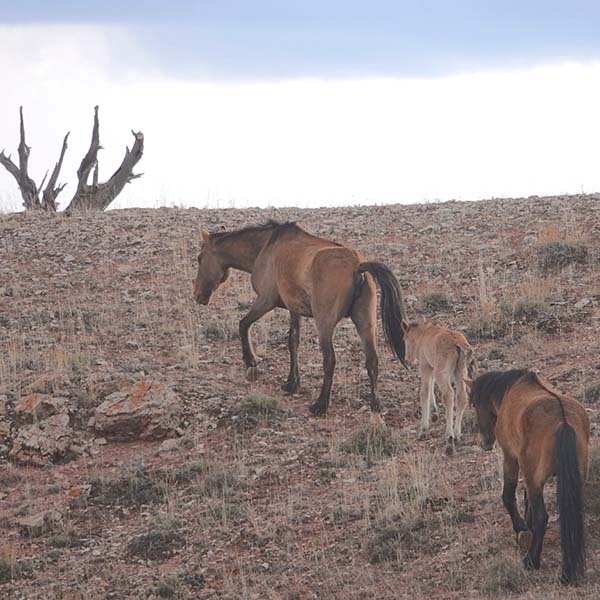 Above the mines on Cheyenne Flat we are lucky to find two of the three foals born last fall---a Cloud grandson and great granddaughter. Little Ryden, named in honor of Hope Ryden, stays close to his first-time mother, Cloud’s daughter, Jasmine. The colt is looking very cute with his fluffy coat. He and his mother are still in their black dark phase but white hairs will soon mix with black to create the lovely blue roan color. Speaking of beautiful, Firestorm, Cloud’s oldest surviving daughter, is near Jasmine and Ryden. The nearly 13 year-old has wintered well. April can be a dangerous month. 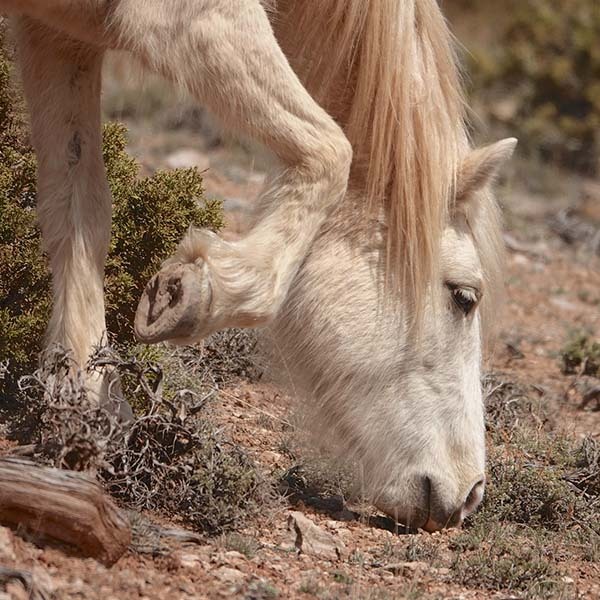 The shock of eating green grass after a winter of dried plants can, on rare occasions, kill a seriously depleted horse. But Firestorm looks fantastic. So does Demure, grullo daughter of Broken Bow and Two Boots and a new addition to Doc's band. Nearby, we spot Horizon’s (He Who) family and little Ruby, born last November, going into the teeth of winter. The stout filly is a fluff ball. Her mother, Jewel, is quite lean but she will beef up as the temperatures rise and the grasses really start growing. Ruby lying down but watchful. Shaking before she gets up. Ruby joins her mother, Jewel. Speaking of tough as nails, back below the mines, Hernando, War Bonnet and 27 year-old Phoenix are making do on meager rations. At 27 years-old, Phoenix is showing her age, but she is alert, cautiously watching our every move. I hope she'll grace the mountaintop this summer. It wouldn't seem like the Pryor Mountains without her. I wish her son, Cloud, could be there too. Of course, he is. We just can’t see him. On day four of our five days in the Pryors, we find Galaxy’s band and Cloud’s little sister, Electra and her daughters and herd mates. Oddly, Payton, Electra’s second to the youngest daughter, is missing and Kristen Collett, who joins us on the mountain, spots her near Cheyenne Flats heading down hill, apparently alone. But, I believe a stallion suitor is somewhere nearby. Stay tuned to this mystery on the mountain! Far below, in the Dryhead, the weather is generally warmer and we have great luck spotting bands at the base of Sykes Ridge just south of the Bighorn Canyon. We are searching for Sorcerer, the lame colt born in February. 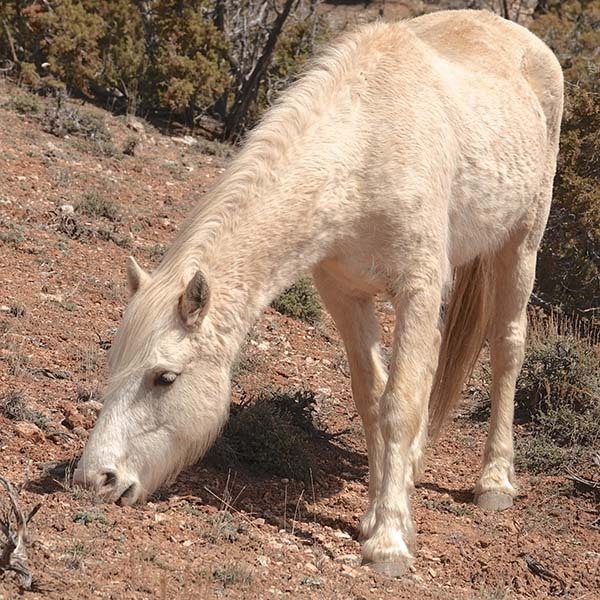 It takes four days but we find him near the Devil's Canyon Overlook with his family and his "new" band stallion. is easy. They are near the gate of the horse range with Nova’s new son. It's our first look at this very strong fellow named Sundance. Two days later, we find him and his mother and father waiting near the lakebed while the rest of the band takes a remarkable walkabout. Before the faraway dam is opened, the lake bed with its trickle of a stream is an expansive playpen--a giant horse sandbox. Even the oldest mare, Seneca, joins in. But Prima, Nova's three-year-old daughter, and Quasar, Kitalpha's four-year-old son, are the primary rabble-rousers, spinning and rearing, and kicking at each other. I don't remember a filly being so assertive to a stallion, but he is her younger half-brother after all! Everyday when we bump up Tillett Ridge Road we glass from high points out into the hell ‘n gone and the hillsides and canyons in between, hoping to spot Encore. On our very last day on the mountain, we get a glimpse of her and hike out on a rocky hilltop to try to get a better look but she seems to disappear. Can you see Encore and Knight? On our way down the mountain, we spot Casper’s primitive looking band. It seems strangely sad not to see their palomino lead mare, Mariah, Cloud’s sister. But we quickly perk up, when we spot the newest member of the family. The dun colt by Moenkopi's side is lively and strong. His name is Shoshone for the Native American tribe and also for the 100 mile-long river that flows from Yellowstone National Park into the Bighorn River and Canyon. 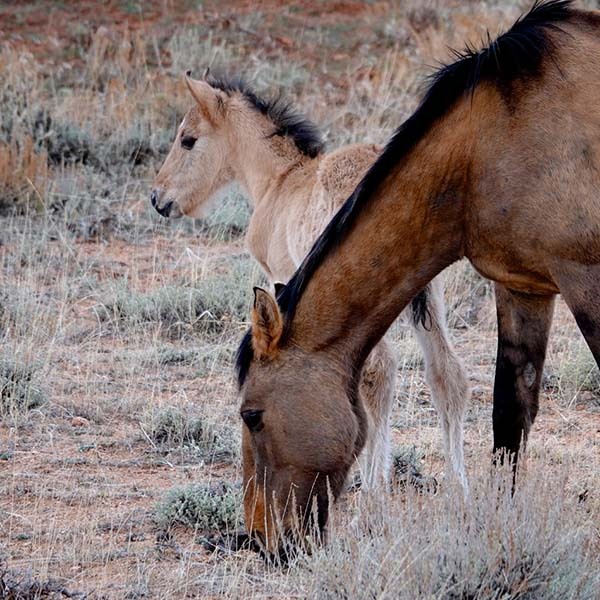 We hike out to see him as he nurses, forages and dances in front of his mother. At sunset he follows his mother with Banjo Paterson following. They climb the hill, disappearing out of sight. 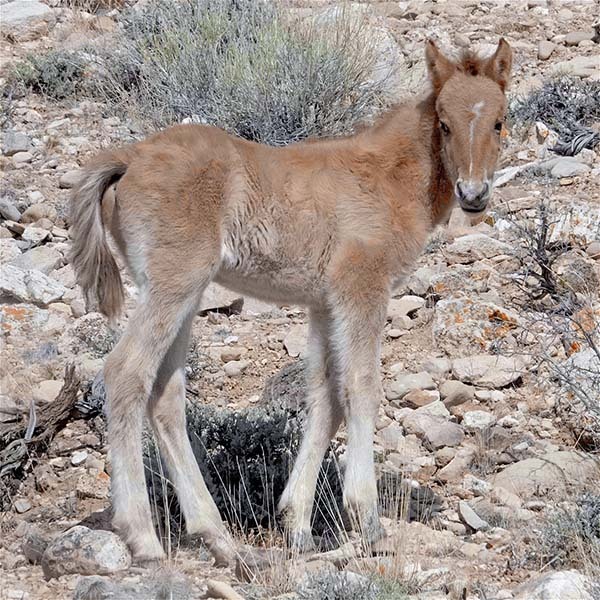 The newest Pryor mustang revealed himself the day after we left the range. Nancy Cerroni allowed us to show him to you here. She named this handsome Penn and Jesse James son, Sentinel. He is the grandson of Hamlet and the Great Grandson of Bigfoot and Conquistador, so he has big hoof prints to fill. Magnificent Conquistador was with our Freedom Family until his untimely death several years ago, likely due to a lightning strike. So a new year begins and new life appears. We wish for these foals a life like Cloud led—one of freedom. 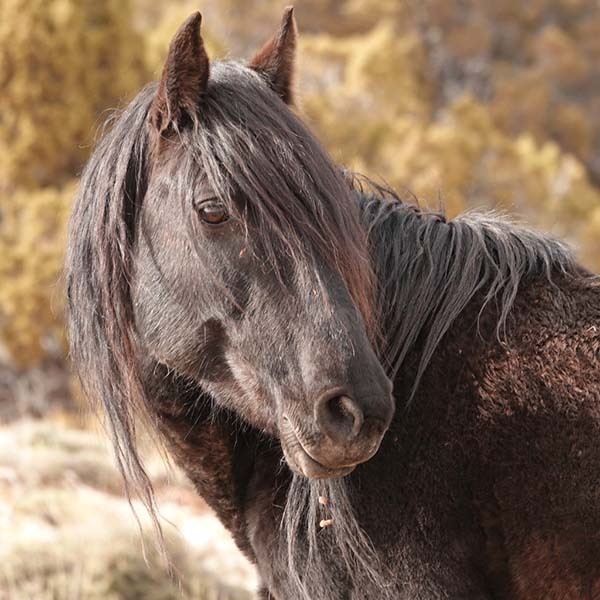 This is what we fight for every day. . .freedom for all our amazing wild horses of the still-wild west.